Roger Fletcher is an educator, historian, artist and author. Over the past 50 years, he and his wife, Sue have run all of Oregon’s wild rivers. Their favorites are the Rogue and the Deschutes. As an educator he believes running white water in a wooden drift boat can be one of life's great teachers. As an artist his re-creations of the original boats stir recollections of his river experiences. Roger Fletcher, an educator, historian and drift boat aficionado has a passion for drift boats and river dories. Learn about their history, design, construction and use. Thinking about building a boat? You won't want to miss this show. As an author he brings to life the men and women behind the early boats. His work has reignited interest in the historical drift boats and dories. As a historian, he has recovered and established the lines and construction each McKenzie, Rogue and Colorado River boat as they evolved over time. Full-size re-creations of the early boats are now being built from his book around the country and the world. The capstone of his work to-date is his book, Drift Boats and River Dories, Their History, Design, Construction and Use. Drift boats and river dories are Oregon’s unique contribution to wooden boat design. McKenzie River drift boats were originally designed as a fly fishing platform. Roger enjoys fly fishing but he calls himself the “accidental fisherman.” He becomes so engrossed in river hydraulics, boat performance and the scenery around him that his catches are quite by accident. The River's Touch is as much about a sense of place as it is about the original drift boats. Roger's passion for the quiet wakes of wood on water is equally matched by his affection for the milieu of the river. His research into the origins of these lovely river craft have heightened appreciation for the men and women behind the early boats. 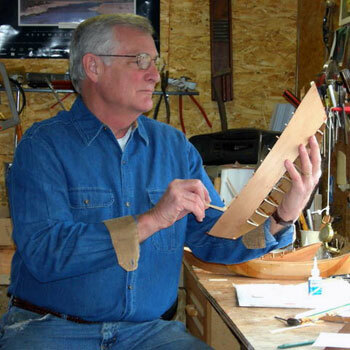 Roger's work represents a unique trans-continental collaboration between he and renowned boat builder, modeler and author, Harold "Dynamite" Payson. "Dynamite has been my mentor for developing my boat research protocol. More important, Dynamite's direct, no-nonsense yet humorous approach to problem-solving and writing has served this verbose academician well. He keeps understandable simplicity alive, and I consider it to be a profound privilege to call him both mentor and dear friend."